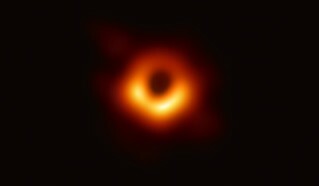 For the first time, a black hole and its shadow have been captured in an image, a historic feat by an international network of radio telescopes called the Event Horizon Telescope. EHT is an international collaboration whose support in the U.S. includes the National Science Foundation. A black hole is an extremely dense object from which no light can escape. Anything that comes within a black hole’s “event horizon,” its point of no return, will be consumed, never to re-emerge, because of the black hole’s unimaginably strong gravity. By its very nature, a black hole cannot be seen, but the hot disk of material that encircles it shines brightly. Against a bright backdrop, such as this disk, a black hole appears to cast a shadow. The stunning new image shows the shadow of the supermassive black hole in the center of Messier 87, an elliptical galaxy some 55 million light-years from Earth. This black hole is 6.5 billion times the mass of the Sun. Catching its shadow involved eight ground-based radio telescopes around the globe, operating together as if they were one telescope the size of our entire planet.